The best strategies leverage both good ideas and good timing. While traditional telecom services are facing challenges (which by now are traditional, too), new offerings, in new areas, are showing promise. Keeping the momentum going (and growing) means investing in IT that can spur and support innovation—and doing it now. Even if the idea and the timing look right, what are the specifics? Where should telcos focus their investments? Can they buck the usual trend of their IT operating expenses increasing along with their capital expenditures? Can increasingly popular levers—such as outsourcing and commercial off-the-shelf software—be leveraged more efficiently? Will moving to less complex solutions and operating models always bring cost advantages? These are some of the key questions addressed in TeBIT 2014, a telco IT benchmarking study jointly developed in 2010 and conducted annually by The Global IT Association for Telecommunications (ETIS) and The Boston Consulting Group. The report that follows highlights the insights unveiled by this year’s TeBIT study. The idea is not only to identify the IT challenges telcos face, but how they can address them. Just as importantly, the report examines how IT can best be leveraged to help telcos seize the opportunities today’s market presents. As it did last year, the study analyzes how telcos are steering their top capital-expenditure initiatives, how levers like outsourcing and commercial off-the-shelf software are being implemented, and how, perhaps, those levers could be optimized still. New this year is a close look at the relationship between complexity and costs. While one might think less complexity means lower costs, the link is not always clear cut. TeBIT 2014 devotes much of its analysis to differentiation, looking at what telco IT departments are doing—and can do—to help set operators apart. Perhaps that is fitting, as the TeBIT study itself is a unique benchmark—created by the telcos for the telcos, and coordinated by an independent nonprofit organization with no financial interest in the outcome. All of this year’s participants have taken part in previous surveys. By participating in this benchmark, operators get an unbiased, in-depth, telecom-specific look at the IT environment of their organization. There has been a tradition among the TeBIT participants to openly share all data (on a company level) in order to encourage discussion and exchange of knowledge. This is the distinct advantage of TeBIT—that is, knowing the companies you benchmark against. To make the sharing of information even easier, this year’s questionnaire was significantly shortened from previous versions, so as to get to the core data while greatly reducing the collection effort for participants. While this executive report is publicly available, companies that take part in the benchmarking can access the full results, including a comprehensive publication containing rich participant data as well as further trend analysis and data correlation. Moreover, participants are eligible for a one-on-one discussion of their company-specific results with the core TeBIT benchmarking team. This year’s findings show IT units continuing their shift in focus from cost reduction to innovation—a strategy that increasingly looks like the right idea at the right time. But the data also suggests that telcos might, in effect, be able to have their cake and eat it, too: reducing operating expenses even as they increase capital expenditures. That would mark a break from past cost cycles, but perhaps that is only fitting, too. For telcos, future growth will mean breaking from older ideas on how, and where, to build business. ETIS and BCG believe that benchmarking and open exchange on past experience can help them do that—successfully, efficiently, and soon. For European telecom companies, it has become strikingly clear: their future is going to look a lot different from their past. Traditional fixed and mobile services are not the drivers of growth they once were. Most operators have seen their revenues fall, the competition continue to heat up, and new customers get harder and harder to find. Growth now means looking in other directions, such as digital and IT services. It means innovation, fast deployment of new products, and a no-compromises customer experience. It also means an IT infrastructure that makes all of the above possible. This is a message telcos get—and are acting upon. TeBIT 2014 finds operators continuing the single most important trend identified in our 2013 survey: increasing their IT spending while focusing investments in areas that can drive differentiation and competitive advantage. This is good news, as the strategy is both savvy and necessary. But this year’s study—in which a mix of integrated, fixed, and mobile operators, from both emerging and mature markets took part—adds a new twist. Even as telcos invested in differentiation, most also reduced their IT operating expenses in line with revenue loss. This is a reassuring finding, to be sure. But it also marks a break with the long-standing pattern in which IT operating expenditure (opex) rises as investments increase—the consequence of running and maintaining new IT. Is this break a temporary anomaly—a brief waypoint as telcos continue their shift from cost-cutting mode to investment mode? Or is it the start of a sustainable trend, in which operators will get the best of both worlds, simultaneously, by leveraging a mix of cost-cutting and revenue-creating investments? Another intriguing development concerns outsourcing. Previous TeBIT surveys always found that high degrees of outsourcing—embraced largely to save costs—tended, in fact, to correlate to high IT spending. But now, for the first time, the correlation has weakened. This year’s study also finds that the relationship between complexity and IT spending is not as straightforward as one might think. While commercial off-the-shelf (COTS) software can mean less complexity, its use actually drives costs. Telcos will have to make some key decisions about their IT. They will have to think strategically and understand the impact and interaction of all the levers at their disposal. This report helps them do that—and not just move forward, but ahead. Appearances, as the saying goes, can be deceiving. No doubt, the business environment remains an all-too-familiar one for telcos, with revenue and average revenue per user (ARPU) continuing to decline for many operators. (See “The Business Environment.”) But at the same time, this year’s study reveals a bigger—and brighter—story. Growth may be lagging in traditional mobile and fixed businesses, but it is growing in new ones, from IT services to video on demand and other over-the-top digital content. These are areas that IT departments will need to support—and the TeBIT data suggests that they are laying the foundation for doing just that. The revenue decline was directly driven by loss in ARPU. On average, participants saw their ARPU drop 3.2 percent, breaking down into a 3.8 percent reduction in mature markets and a 2.6 percent reduction in emerging markets. In terms of EBITDA, operators in mature markets did hold an edge, with an average increase of 0.4 percent compared with a 13.3 percent drop for emerging market telcos. The story was similar for profitability, with EBITDA margin slightly positive in mature markets (with a 0.9 percent average gain) but negative in emerging markets (with a 5.6 percent average decline). Gaps between the market types were also seen in opex changes. Mature market participants managed to reduce their opex by 4.5 percent, which helps to explain their stable EBITDA. Emerging market players, on the other hand, saw their opex increase by 7.2 percent. Capital expenditure changes varied even more significantly—rising by an average of 20.3 percent in mature markets but by a less eye-opening 8.8 percent in emerging markets. 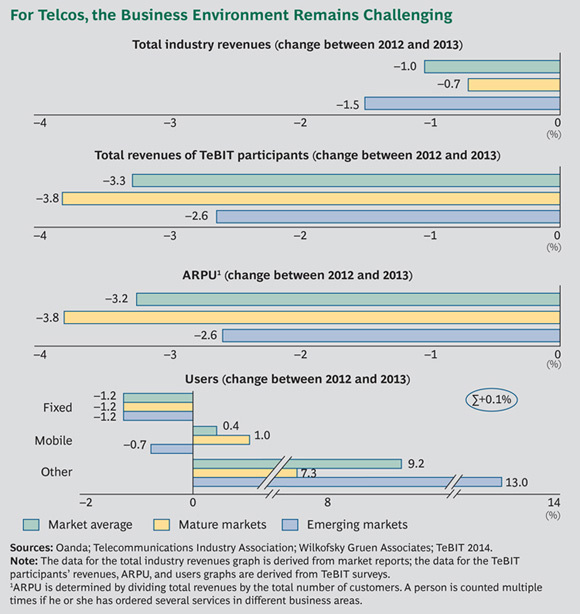 One area devoid entirely of eye-opening change was subscriber growth in established telco businesses. On average, the fixed-user base declined 1.2 percent for TeBIT participants, while the mobile base grew an anemic 0.4 percent. The action (and the potential) lay in the “other” category—a comparatively small area of nontraditional offerings, but one that saw a 9.2 percent increase in users. There, at least, it seems that the “new news” is the good news. This “spend money to make money” approach was something we first saw in our 2013 survey. It was notable because it was in stark contrast to previous years, when the focus of IT departments was on aggressive cost reduction. And it seemed the smart thing to do. With their established businesses stagnating (and worse), telcos needed to bet on the future, which required investments focused on innovation and differentiation. If there was any doubt about that, this year’s TeBIT data should dispel it: while less than 10 percent of participants saw their customer base in traditional telco services increase, almost a sixth of all revenue (17 percent, on average) now comes from nontraditional offerings. That is a figure telcos can—and must—grow. It will require continued investment in the IT systems that support the new routes to value, but the timing is fortuitous for many telcos. Our analysis of expenditure patterns suggests that 65 to 75 percent of participants will be increasing their IT capex in the coming years. They need to make the most of that opportunity. Outsourcing continues to expand its role within telco IT departments: on average, it accounted for 26 percent of total IT spending, up from 23 percent in our 2013 survey. While outsourcing can be a lever for many different things—accessing new skills, reducing speed to market, and decreasing head count were all cited as reasons for its use—cost reduction, once again, topped the list. More than a third of participants (36 percent) said that savings was their prime impetus for outsourcing. Does that mean the trend is, at long last, reversing? It is too early to be sure, but there are signs that telcos are, perhaps, gaining a better understanding of how to leverage outsourcing. Overall, COTS seems to have reached a relatively high level of maturity. When participating telcos were asked about their satisfaction with COTS in each process area, only 10 to 15 percent of responses indicated room for improvement. But the analysis of COTS did reveal a potential bump in the road: its use drives costs. That might seem counterintuitive; after all, COTS should be less complex than something built from scratch. Yet the data—and the link it revealed—was quite clear: a high degree of COTS use correlated to higher IT spending. What is going on? Several things. For one, these packages often require customization to meet an operator’s specific needs, and those costs, telcos are finding, can be hard to keep down. Moreover, there are annual maintenance fees to pay—fees that do not exist for proprietary software developed in-house. Finally, the market environment for certain processes—namely, those with just a couple of dominant players—means that providers can ask for, and get, high prices for (effectively) “market standard” software. As with outsourcing, telcos need to consider their goals for COTS carefully and ensure that it is being used where—and how—it has the best chance of meeting them. This year’s TeBIT study takes a closer look at how complexity affects IT spending. Understanding the link between the two is vital as telcos fine-tune their IT operating models, pulling (or not pulling) the different levers at their disposal. But as the COTS example demonstrates, the relationship is not always obvious or straightforward. Overall, complexity, as one would expect, does appear to drive costs. Taking into account various factors that push complexity in one direction or the other—such as the number of freelancers a telco has to manage and the degree to which it leverages outsourcing—each participant in the TeBIT benchmark was assigned a “complexity index” from 0 to 100. Higher index scores did indeed correlate to higher IT spending, measured as a percentage of revenues. (See Exhibit 6.) But when we drilled down to individual drivers—looking at each complexity factor in isolation from the others—things became more nuanced. Not every driver moved the dial equally. The TeBIT data showed a clear link, for example, when it came to external head count. The more a telco’s IT staff was comprised of outside professionals, the higher its IT spending tended to be. The role of externals, it should be noted, varied greatly from telco to telco. Only about half of the participants used externals at all, and usage was greater in mature markets than emerging ones. The reasons for embracing them would appear to vary, too: our analysis of internal versus external costs suggests that for roughly half of the telcos using them, externals helped fill in missing capacity. For another 19 percent, the motivation seemed to be filling in skill and knowledge gaps. Given that these are common needs for telcos across regions and market types, we expect the use of externals to grow. As telcos increase their reliance on them, they should understand that for all the benefits that may bring, savings is not likely to be one of them. A correlation between complexity and spending was also seen in the degree of outsourcing. Telcos that have clearly embraced—or clearly avoided—outsourcing tended to have lower IT spending than those that have taken a more mixed approach, which is more complicated to manage. Indeed, we found that spending seemed to peak with an outsourcing degree of around 50 percent. That is a figure that may give telcos pause, given the prevalence of the “partial” outsourcing model. From a purely financial perspective, going 100 percent with outsourcing, or going 0 percent, would seem to be ideal. But outsourcing brings other benefits—such as needed skills and resources—and, crucially, it does not bring them equally in every function area. Previously, we saw that even with their “mixed” approach, telcos are stressing outsourcing in some areas more than others. One idea might be to ratchet up its use further in those areas. In that way, the overall degree of outsourcing will rise, and telcos should reap the cost advantages that brings. One might reasonably expect that for the service model, too, complexity would drive spending. Telcos, after all, have two different levers they can pull—IT services and IT outsourcing— and an approach favoring one over the other would be easier to manage than a mix. But in this case, we saw a much weaker correlation between complexity and costs: the share of IT services versus IT outsourcing appeared to have little impact on spending levels. Then, of course, there was COTS, which typically means less complexity than built-from-scratch solutions. As we discovered, however, a higher degree of COTS usage seemed to actually drive IT spending. The nuanced relationship between complexity and spending is something IT departments need to carefully consider as they tweak—or even overhaul completely—their operating models. But they should also consider the potential business benefits of any approach. COTS, for example, might not reduce costs, but it can bring advantages that nonetheless tip the scales for its use. These will not be easy calculations for telcos, but by better understanding the variables, they can do a better job solving the equation. IT Cost Cycle: Adjustment or Fundamental Change? While increased investment, largely focused in areas that can spur differentiation, may be the big story coming out of telco IT departments, another finding also warrants attention: For the majority of participants, IT opex decreased. (See Exhibit 7.) On average, it declined by 4.4 percent, meaning that, in contrast to the findings of our 2013 survey, telcos managed their IT operating expenses in line with—and sometimes even ahead of—revenue loss. That is no small thing, but the significance of the drop may be greater still. Historically, telcos have tended to follow a specific cost cycle for IT. It starts with pressure to reduce costs, which leads to lower IT capex and greater efforts at efficiency. After a few years, telcos will find themselves on a better financial footing—both IT capex and IT opex have decreased. But at the same time, their ability to innovate has been hampered by the lack of investment. So IT capex is increased, and as more complex technologies and products are introduced—and need to be supported by IT—IT opex increases as well. At some point, pressure to reduce costs mounts once again and the process repeats. This cycle is a sort of compromise telcos strike. Every three to five years, they switch between cost-cutting mode and investment mode, absorbing whichever trade-off—greater investment and higher IT opex or less investment and lower IT opex—better suits their needs at the moment. This year’s drop in IT opex seems to “break” the compromise, as it is coming well after the time investments started growing. The big question is what does this mean? Is it simply a delay in IT opex increase as telcos transition from cost-cutting mode to investment mode? Or does it signal a sustainable change to the cost cycle, with telcos mixing revenue-creating investments and cost-cutting investments instead of alternating between the two? For this dual-track approach to work, telcos would need to have a good mix of both investment types. One sign, perhaps, that they are heading in this direction: a slightly weaker investment focus. In our 2013 survey, telcos steered 41 percent of their IT capex to their top five initiatives. This year, survey results showed they steered less than 37 percent to them. That change makes sense if telcos have been tweaking the balance between their “efficiency” investments—which tend to be spread out among various projects—and their “growth” investments. As in previous years, we also saw significant gaps in IT cost levels among participating telcos, ranging from 3.9 percent to 8.0 percent of revenues. The difference this time was that TeBIT’s “normalization” analysis—intended to enable a more “apples-to-apples” cost comparison by accounting for differences in company size, business mix (fixed-only, mobile-only, or integrated), and IT complexity—did not narrow the gap to the extent seen in the past. In fact, after normalization, IT cost levels were only slightly more aligned. (See Exhibit 8.) One explanation for this could be telcos transitioning from cost-cutting mode to investment mode at slightly different times—some switching a bit earlier or a bit later than others. In that case, cost levels would temporarily be out of sync, but would become much more consistent once all telcos have moved into their investment phase. At the same time, fixed operators are seeing their spending increase, a factor that is also working to flatten the curve among the business mixes. A likely explanation here is fixed providers replacing legacy infrastructure—a transformation necessary to support more sophisticated offerings such as digital content delivery, as well as more customer-centric capabilities such as self-service portals. All of these findings support one overriding message for telcos: Even as they invest in state-of-the-art systems that can help set them apart, they should not overlook the less glamorous outlays that boost efficiency and reduce operating expenses. With the right balance of investments, telcos can have their cake and eat it too—differentiating themselves, but keeping the day-to-day costs of that differentiation in check. For telco IT departments, the shift from cost-cutting mode to investment mode is not just sound, it is vital. With traditional mobile and fixed businesses struggling, growth must come from new services and experiences; from innovation and differentiation. This requires new skills, new products, and even all-new technologies. None of it will come cheap. The continuing increase in IT capex shows that telcos understand that they have to spend money to make money. Of course, it is not quite as simple as that. Telcos will have to make key decisions about the pace and the focus of those investments. Should they lead the pack—or purposefully lag some distance behind? Some operators are already further along than others. Those that get out of the gate early and strongly will be in the best position to reap the benefits of differentiation—specifically when new customers are drawn to new offerings. But those that stay the course longer with cost reduction will reap greater savings. Telcos have to ask themselves: do we compete on innovation or on cost? They will need to make decisions, too, about how to optimize their IT operating models. The fruits of their investments will impact running costs: more sophisticated products and technologies may cost more to manage, or require additional systems. The crucial point is that these are strategic decisions. They need to be made not in a piecemeal way by individual IT units, but top down, guided by an overall vision and how to get there. This year’s study, for example, suggests that telcos will see a bigger payoff from outsourcing when they carefully consider where—and to what extent—it is deployed. That requires seeing the big picture, instead of making isolated decisions for each IT process. To be sure, some key questions do not have ready answers—at least, not yet. It is too early to know if the concurrent increase in IT capex and drop in IT opex signals a sustainable change in the cost cycle. Time will also tell how long this new investment mode will last and when a cost-cutting mode will take precedence once again. Whether telcos opt for a four-year investment or a quick fix, there is no getting around one fact: they will face risk. But as this year’s study clearly highlights, the bigger risk is not taking it. The authors thank all participating telecom operators and individuals who contributed to TeBIT and to this publication, including Helene Graham, Paolo Valvassori, and Ahmet Zerey. They also want to acknowledge Linus Bergström for his assistance with data validation and analysis.